Hamilton's parks department has committed to taking down all soccer nets every fall and is even going so far as to ask the groups that use the fields if the nets are necessary after a deer was euthanized because it became tangled in one. It's a move that's being celebrate by Chantal Theijn from Hobbitstee Wildlife Refuge in Jarvis, Ont., who helps about 2,500 animals across southern Ontario each year, including the deer which was killed in a Dundas park Sunday. Theijn said animals getting caught in soccer nets is more common than most people realize. 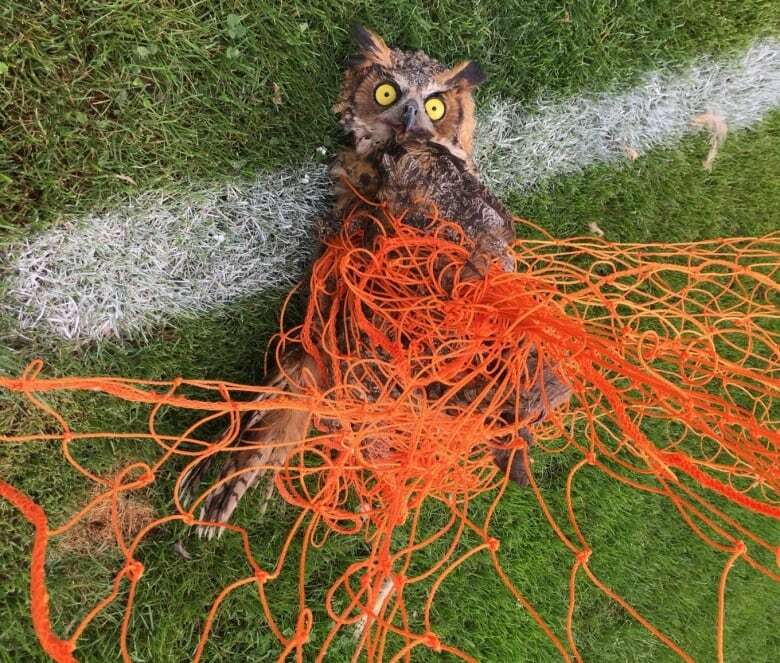 She responded to 5 or 6 cases involving deer last year and about 15 involving birds of prey, especially owls, who can't detect the netting while hunting at night. 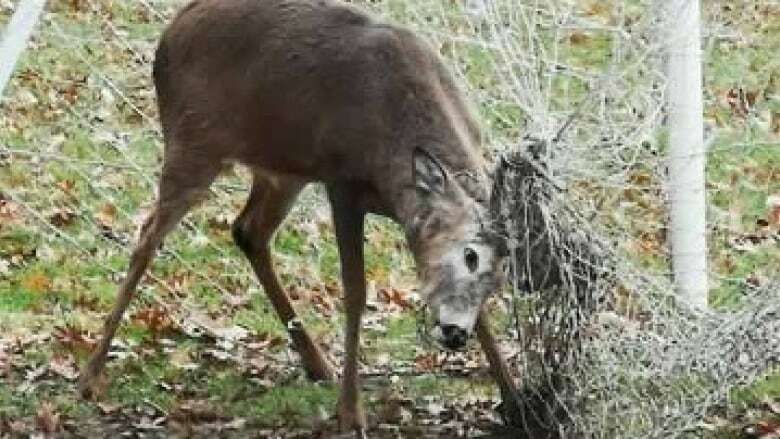 The buck whose antlers got wrapped up in a late-season net that was still hanging in Sanctuary Park in suburban Dundas was shot and killed by police following efforts to free it. Theijn, who was called to the park by Hamilton Animal Services, described the animal as "extraordinarily stressed," meaning the sedative she tried to dose it with didn't have any effect. "When deer are really, really stressed their adrenaline cancels out any drug you could give," she explained. "You could give them an elephant dose and nothing would happen." Undeterred, Theijn had other people on hand distract the deer while she snuck behind it and worked to cut it free. As the netting dropped away, the animal managed to yank itself out of the goal and ran off, with netting still hanging from its antlers, but it was still showing signs of distress. "It stumbled down into the ravine and laid there for a little while kind of panting," said Theijn. "It tried to regain its footing but stumbled and fell into the creek." After watching from a distance for 10-15 minutes she made her way down the steep incline for a closer look and said it was clear the deer was suffering from capture myopathy — an irreversible, deadly condition caused by extreme exertion or stress. Signs of the disease include shivering and muscle paralysis, which Theijn said was already being exhibited in the deer's hind end. "I realized the deer was not going to recover from this ordeal. We had a choice between leaving the deer to slowly die and expediting it." Brad Potts, supervisor for Hamilton Animal Services confirmed his staff contacted the animal refuge about the injured deer and that police were asked to euthanize the animal once it became clear it was injured. Const. Jerome Stewart said officers were called to the park around 11 a.m. and euthanized the animal. He added police are contacted several times each year to euthanize deer, especially in Dundas, but he had never heard of one getting caught in a soccer net before. "We get called for a situation and we have to respond and be as humane as possible in executing our duty," Stewart said. Kara Bunn, manager of parks and cemeteries for Hamilton, said the groups that use the city's fields are responsible for putting up nets and taking them down. "In light of this tragic event, the City of Hamilton will be ensuring that nets are all down in the fall and will be asking the user groups if the nets are required at all," she added. Theijn said the city's reaction was "fantastic." "It's great that the City of Hamilton has said that and I applaud and appreciate that. Now hopefully other cities and municipalities will take note and follow suit." She added she has nothing against soccer, but noted there's a "stupid-easy" way to stop animals from suffering in these types of cases. "As humans we really have to do this. This is something that costs nothing, just roll up the nets."